These Click watches come in one style and one style only, geek. Made up from circuit boards that take you back to the 80s in retroness style. 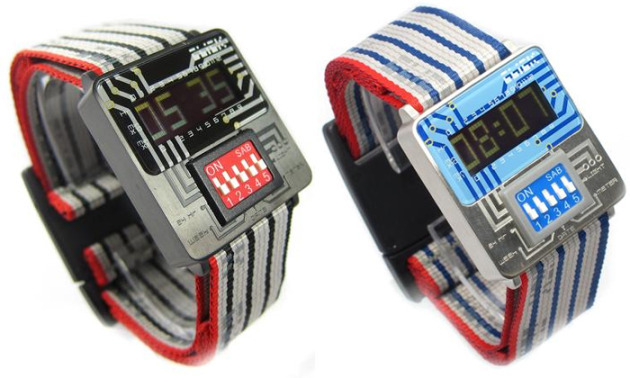 Aside from the electronic watch face design, the Click's DIP switches are fully functional and are used to toggle between the different types of features to display date, month, day of the week, 12 and 24 hour time as well as a challenging bar graph metered time display and backlight all on a small LCD. The Click watches are available in various dial faces and colors and are available in a electronic ribbon-style wristband for $149.99, as well as a stainless steel flex wristband for $169.99. 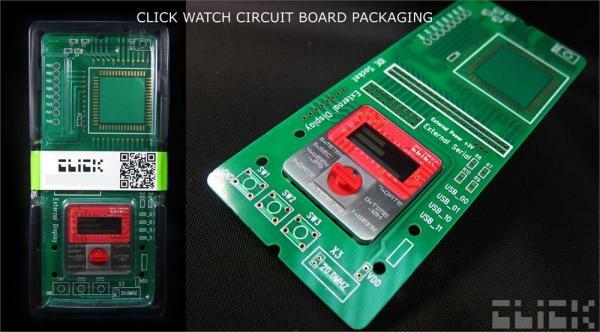 They even come packaged on a circuit board, no joke.